I was watching the Master Chef cooking show on Television and one of the challenge dishes was chicken and waffles. It was touted as a Southern comfort food. I grew up in Missouri and vacationed with relatives in Arkansas and Oklahoma and went to college in Texas. Never were chicken and waffles on the menu anywhere. So as any good TV show or movie or book should do, it sent me to research and to read about this dish. And in this day and age that means browsing the web for information. As a kid I would have gone to the end of the hallway to the bookcase in which the World Book Encyclopedia was housed. I have fond memories of those Encyclopedias. That is where I found the college in Texas that I attended and graduated from, Baylor University. My mom made pancakes, not waffles. We did not have a waffle iron. The waffles we ate for a fast breakfast were small rectangle ones that came from the frozen food section of the local Kroger. After my older sister moved back home with my parents her kitchen stuff came with her. I remember visiting and seeing a waffle iron sitting on top of the fridge. It was not used. I had small children and I actually thought about taking it back East with me but I did not know how to operate it and felt intimidated by it. The house has been cleared out now for years so hopefully it found a good home. Perhaps my niece took it but I do not know. My daughter got married and she received a waffle maker for her home. She made waffle making look easy. So one day when she and her husband and I and my husband were out “tag-sale-ing” I picked up a waffle iron for $5. I’m making waffles one fine Saturday morning for them and I think I saw a small blue arc when I plugged it in. But perhaps my eyes deceived me or I just denied it to myself! Half-way through the waffle making the blue arc returned in full force with accompanying smoke and crackles; I reach behind the appliance quickly and pull the plug from the wall. Needless to say we ate pancakes that morning and that $5 went into the trash. (Actually it was an appliance so we took it to the town dump for disposal). My daughter soon replaced it with a brand new one for Christmas that year. What a sweetheart! Now I do make waffles on occasion for weekend breakfasts with no fear of starting an electrical fire in my kitchen. Any leftovers freeze well for reheating in the toaster. But I have not made chicken and waffles, nor do I plan to. Now fried chicken was served frequently in my childhood home. My mom had a marvelously large steel or aluminum skillet with a domed lid. (I was unable to find this when we cleared out the house. It was not “old blackie” the cast iron one.) She would buy whole chickens, cut them up into parts, put a large scoop of Crisco in the pan and when it was good and hot she would drop in the chicken parts. To prepare the chicken parts she would lay out a sheet of wax paper on the counter on which she separated the parts. She then liberally sprinkled them with salt and pepper and dusted them with flour. She turned the pieces over and sprinkled them again with flour so they were mostly covered. The chicken had its skin left on. It was not the crispy crusty chicken one buys at Popeye’s or KFC but was good eating. This was served with mashed potatoes and cream gravy. The gravy was made from the drippings in the frying pan. So this brings us to chicken fried steak, or country fried steak depending on what part of the country you live and if eating it at home or at a restaurant. 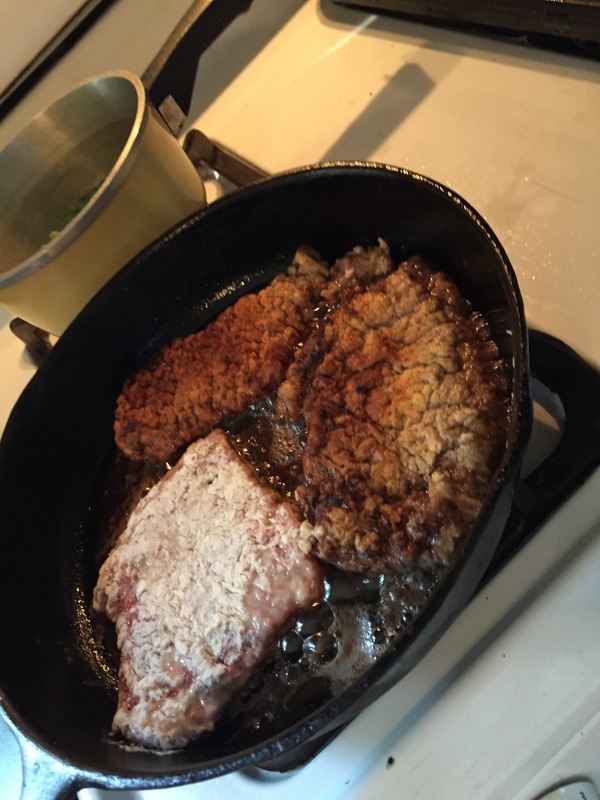 My mom did fry steak similarly to how she fried chicken. I don’t remember her calling it “chicken-fried”. This was a popular meal to have at one restaurant/bar I occasionally frequented in Waco. In her older years Mom would order this at the local Bob Evans Restaurant .My husband had his first taste of this dish when we were vacationing in Virginia this year. I decided to make it for him at home. We start with cube steak. Be sure to have a mallet, waxed or parchment paper, salt and pepper, and flour. Since I am a bit fancier of a cook than my mom I also have a bowl of egg beaten with a splash of milk. I am thinking this will make a crustier version than Mom’s. It does a little. 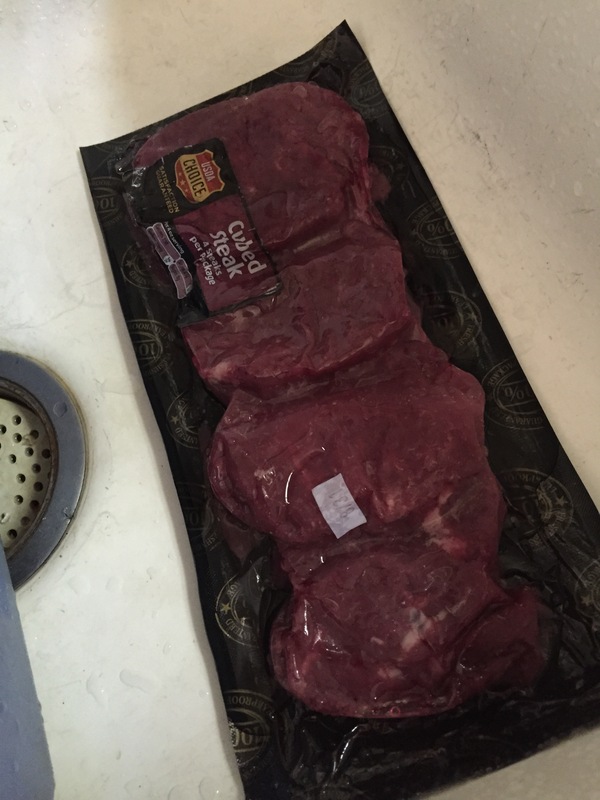 Pound out the meat even though it has pounded out markings on it coming out of the package. 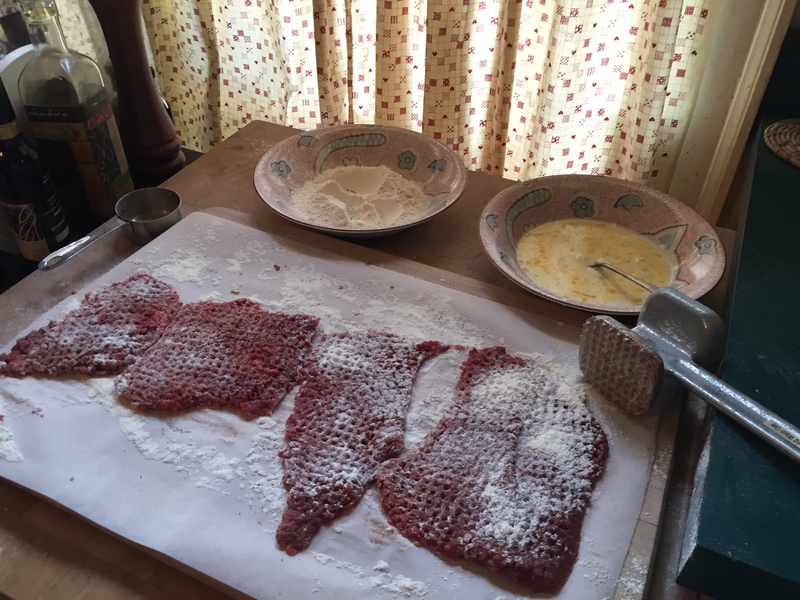 Use salt and pepper as desired and flour it and then pound the flour into the meat. Turn the meat and repeat. Heat a small amount of cooking oil in the cast iron skillet and get it good and hot. Dip the pounded meat into the egg bowl and then flour it again on both sides. Fry up the steak a few minutes on each side so as not to overcook. Remove steaks from pan. Make your gravy: scrape up the bits in the pan, add flour and milk. 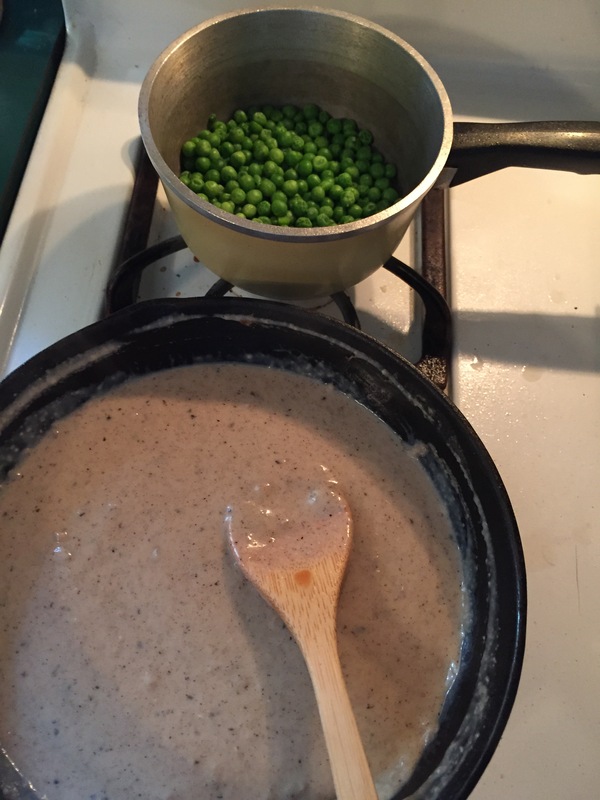 My husband snuck in some half-and half so we had creamy gravy! I do not always have success with gravy. I had to add a bit more butter and I put in a bit too much flour. My husband tells me that I’m spending time with my mom (she died in 2003) every time I go through her recipe books and think of her when I am in my kitchen cooking. Hi Mom, I love you always. I read cookbooks and I read books about cooking and books by people exploring food choices. I just finished Year of the Cow by Jared Stone. Well written and enjoyable. He has some of the same cookbooks I do and he watches Alton Brown. I recently read 100 Days of Real Food by Lisa Leake. Last year I read Vegan Before 6 by Mark Bittman. I’ve read Michael Pollan’s In Defense of Food and The Omnivore’s Dilemma. And many others. One interesting recent read was The Big Fat Surprise by Nina Teicholz. I’ve looked at diets, eating plans, and who recommends what foods to eat. But I just can’t follow these guidelines to the letter. I start out with good intentions but get lost in one or two or five or ten of the details. The first detail is where to buy the food. I have a pie-in-the-sky ideal of being a locavore. When I had a commute I would pass by a farm market and I would buy fresh and local produce once every week; I no longer have that commute and that farm store is out of the way. I looked into CSA (community supported agriculture) but don’t have commitment to go, again out of my way, to a farm each week, usually during the day hours, to pick up a box of vegetables. There is a service that actually delivers from the farms and I am thinking about that. $45 for a box of unknown/uncertain veggie fare each week. That could be interesting. I shop at discount grocery stores. This saves me 1/3 to 1/2 of the cost of groceries from the chain stores. It would be a trek to Trader Joe’s and/or Whole Foods and I am not willing to invest the time, gas, or money for those trips. Maybe on occasion. Even at Trader Joe’s I could not find Cottage Cheese without additives and I had to read all the organic foods and found preservatives anyway. Daisy is the only brand for cottage cheese and I have a difficult time finding the cottage cheese. Next time I find it at my local Walmart my fridge will be full and we will be eating Cottage Cheese until the cows come home! I am able to find reasonably real food at the discount stores. I do not always insist on ‘whole wheat’ for all the wheat. I will tolerate “cane sugar” in some foods that are generally made with sugar. 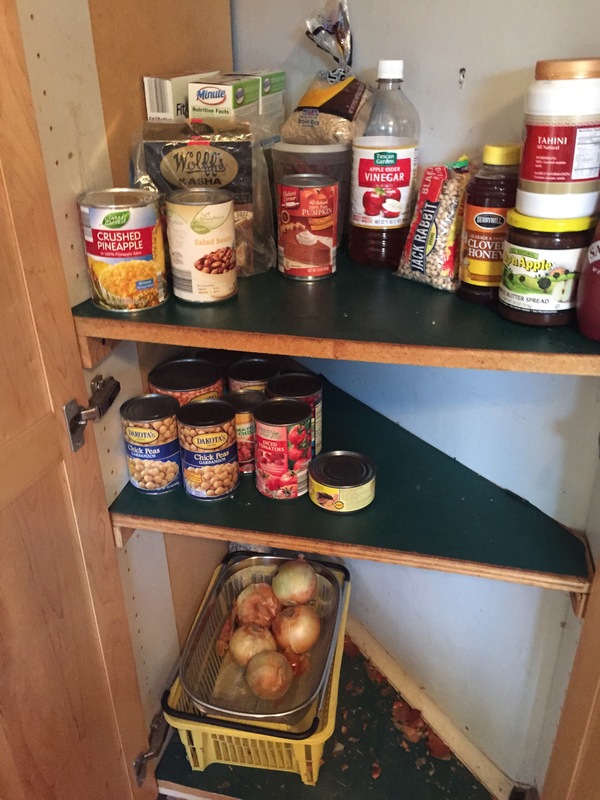 I went through my pantry and found high fructose corn syrup in relish and sugar in roasted red peppers! That is just unnatural. We did decide to switch from half-and-half to whole milk since I do not like paying three times as much for natural (ingredients of cream, milk) and it is not always available. I no longer buy low-fat or non-fat creams, cheeses, sour cream, or yogurts. Some of my cans of beans had EDTA in them as a preservative but I am not willing to give them away. I will just be more selective next time. 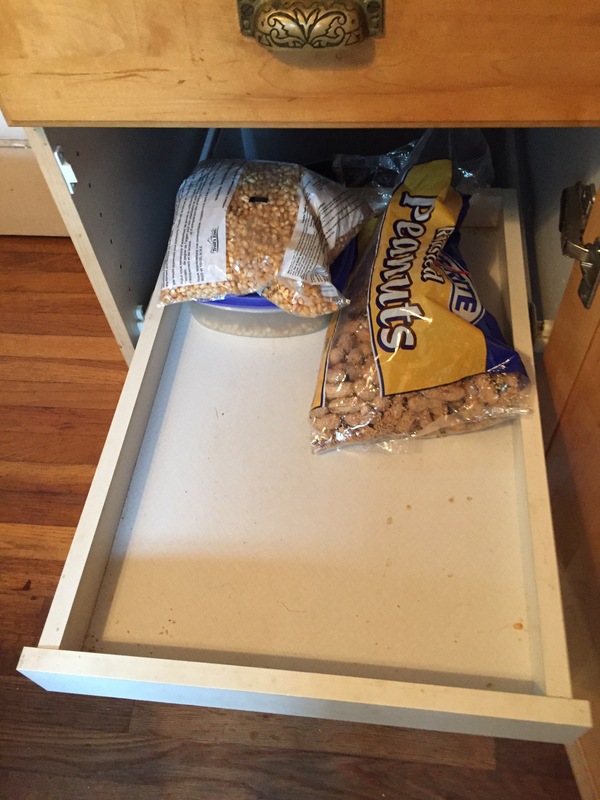 Here’s all that was left in my snack drawer and in my pantry when I cleaned out the “bad stuff”. I admit I did not throw away the bad stuff but shoved it to the back. I wasn’t sure where to classify my Craisins; they have added sugar. But I use them instead of raisins mostly because I really like them, especially in baked goods. There was even sugar in the olives! Some items just had too many preservatives. But there was not a lot of junk food there. In fact I think that it isn’t really bad. It’s just not all whole wheat and a bit more sugar and preservatives that most of my reading suggests. Which comes to me being a slacker. I tried to get rid of eating anything that I did not recognize as real food in the ingredient list. I must say that my husband is into reading ingredients as well. I tried using only whole wheat flour, even King Arthur’s White Whole Wheat, and it did not work out well for pizza dough. I will use a blend of all-purpose and whole wheat for most items, except cake. Maybe not pie crusts. Not sure about cookies. Sometimes I chuck the whole notion and buy the crispy rice cereal because I have a bunch of marshmallows leftover from camping trips and I am going to make crispy marshmallow bars with added butterscotch chips. I did not even bother looking at the ingredients of the butterscotch chips! 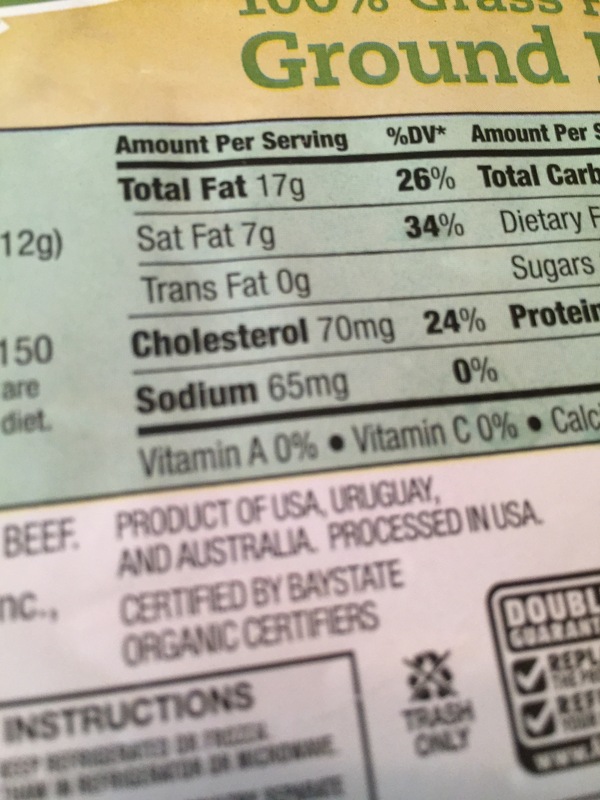 But after my recent reading I decided to buy the grass fed beef package at my discount grocer. This cost three times per pound than my regular ground beef purchases. But we were game and wanted to determine if it tasted better and worth the money. 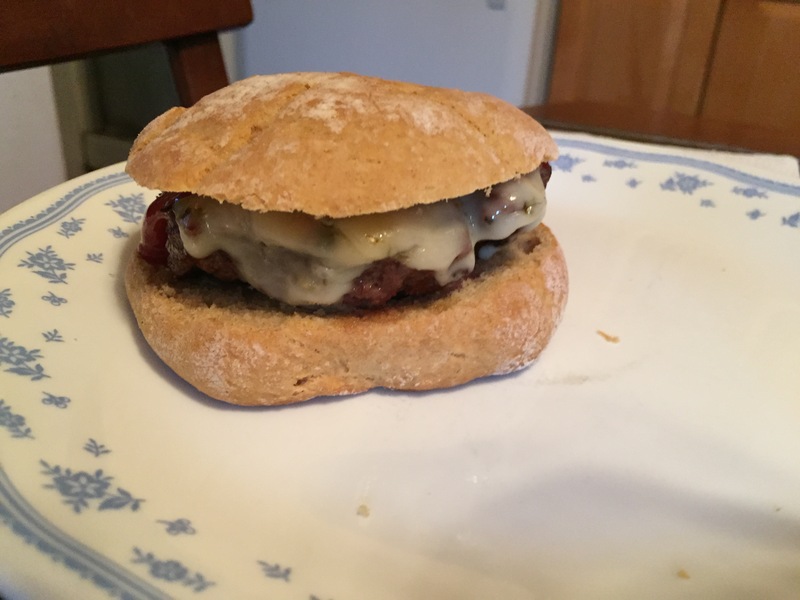 I thought I might as well make homemade buns as well. I did not have the time to make yeast buns so I divided an Irish Soda Bread recipe into six buns. 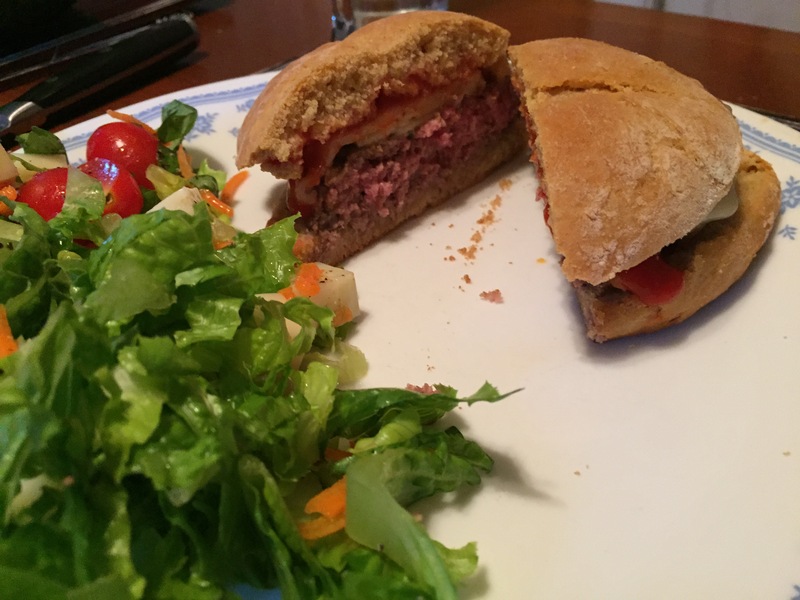 Well these burgers will be placed on scones but they are homemade so who cares! One pound of grass-fed beef. It may be grass-fed but it certainly isn’t local! 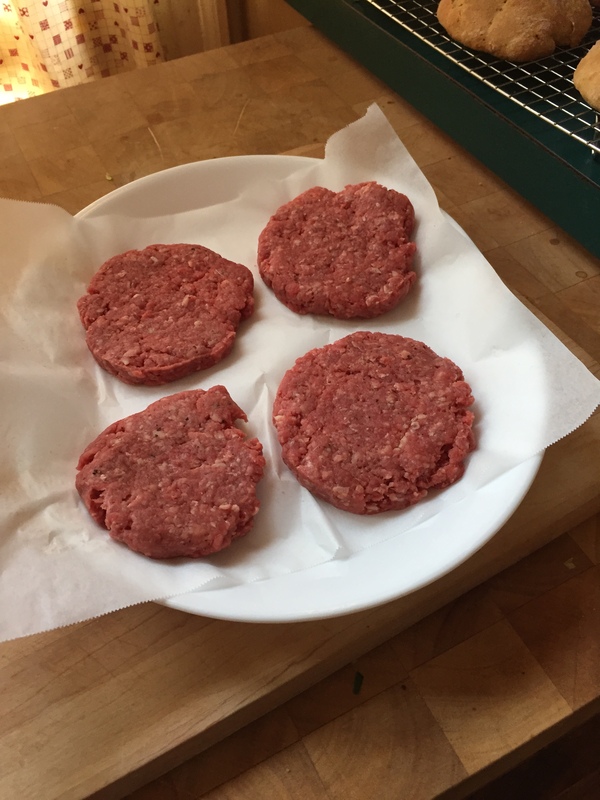 I set it out to get to room temperature (to cook evenly) and form quarter-pounders. I turn on the gas grill and let it get hot. I plan to cook these medium rare so we can taste the beef. The burger looks nice. It is medium rare. Because it is grass-fed I am not as queasy as usual for eating rarer meat. It makes a nice cheeseburger. Neither my husband nor I are truly impressed. Some of you may argue that because the beef came from international parts that it will not taste as wonderful as truly local grass-fed cows. That may be true. And if I come across some New England grass-fed beef for a reasonable price per pound I will gladly try this experiment again. Life in my kitchen starts at about 8:30 PM the night before. There is a need for coffee in the morning. Good, hot, strong coffee. This means filling the Mr. Coffee with water and grounds and setting the delayed start so that at 6:00 in the morning the coffee will brew. If it is a hot humid summer night the ceiling fan is left on at the lowest setting to give the cats a breeze to sleep by. Felix the Cat is known to sleep on the kitchen floor in the summer. His other favorite locale is the upstairs bathroom rug. Morning comes and I wander down the stairs in search of caffeine. 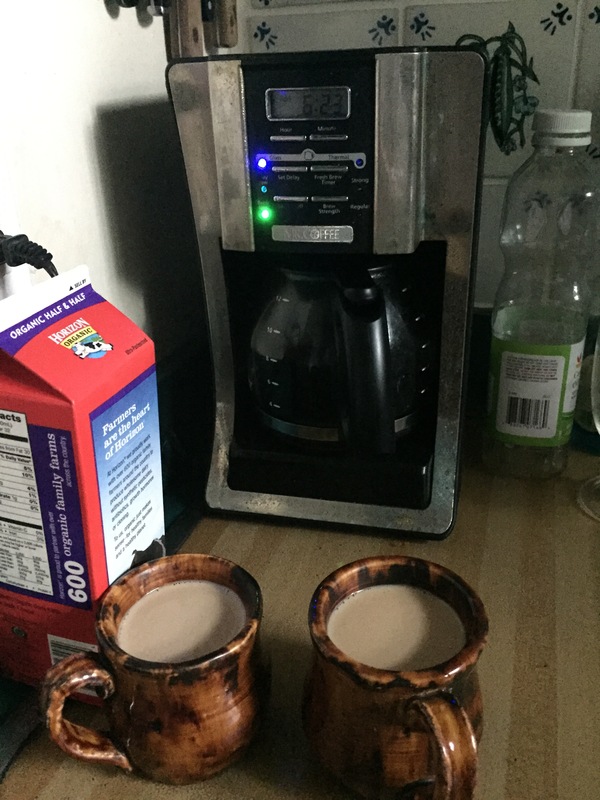 Get out the half-and-half from the fridge and cups for coffee. I have a lot of coffee mugs. These have been gifts to me and from my children over the years mostly from places visited such as Puerto Rico, California, Cape Cod, and more. After the coffee is poured the meowing cats must be fed their ½ can of cat-food. 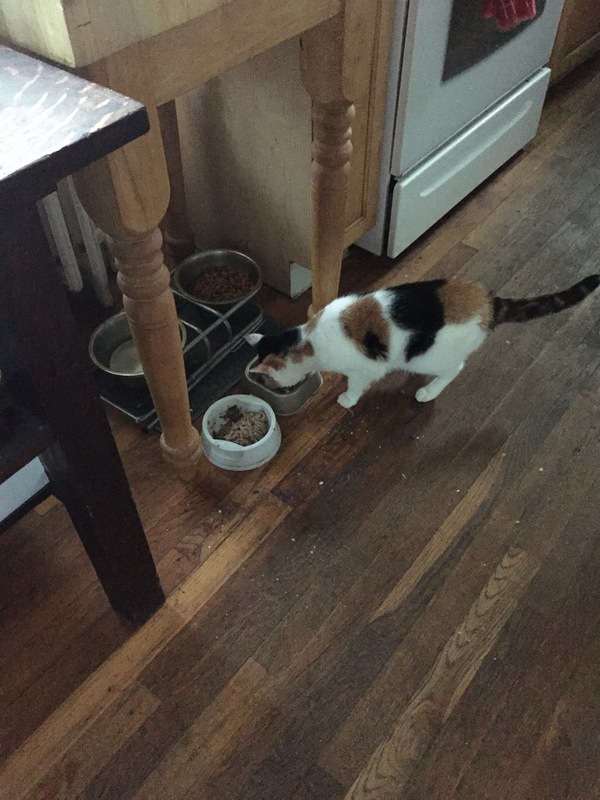 Squeaky, also known as Little Kitty, is very loud until she gets her dish. 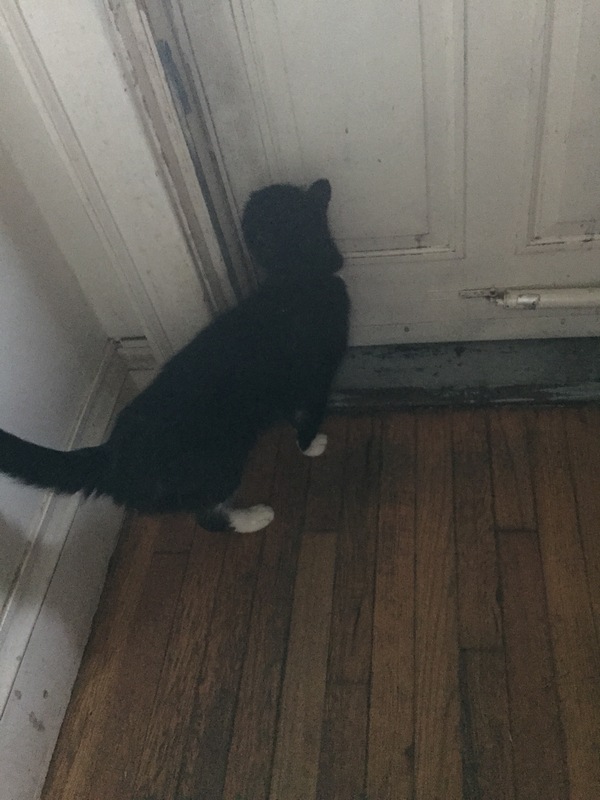 Felix hangs around but is often more interested in going outdoors first. The kitchen door is the one most traveled between the home and the world at large. The kitchen also houses a sink full of dirty dishes from the previous day, or days! In this household it is the man of the house’s chore to wash dishes. This is fabulous! Doing dishes has been the least favorite housework chore all my life. As a single parent for ten years I was blessed to live in apartments that had an automatic dishwasher. Sometimes when I sense that my husband is feeling overly stressed and tired I will wash up the dishes. Lately they have piled up because the morning routine was changed when we rehabbed our upstairs bathroom and now shower upstairs. For ten years in this home it was the ¾ bath off the kitchen that was used. This allowed my husband to be downstairs before dressing for work and he could do dishes without getting water on his work clothes. So when I observed that this had changed, he, like the wonderful husband that he is, has been making it a point to take care of the dishes each morning. I usually am in the kitchen before him and put away the dishes from the drain. I return at the end of my work day. I commute three minutes each way. I should walk but that means packing up my workbag differently. I could bicycle but that means packing up my workbag differently. And I have too many totes and handbags to take into consideration so when I settle on one for the month or season I need to stick with it. For at least a week or so. Back to the kitchen…The cook book with the eggplant recipe is sitting open on the counter where it has been for the past three days. Big Kitty (Felix) comes in with me looking for more food. The hook on the basement door awaits my bag and purse. There are no dirty dishes this afternoon. I pour a glass of iced tea and re-read the recipe. I have 53 cookbooks in view in my kitchen located on various shelves. In addition there are several notebooks that are filled with recipe printouts and clippings. There are a few books on food science and housekeeping in general. Sounds like a fifties housewife! This cookbook is a Better Homes and Gardens collection. I have liked their selections/collections over the years. Lately they have moved away from the canned soup ingredient dishes which I appreciate. I assemble food from time to time but don’t like using condensed soups anymore. I bring the cookbook with me to the fridge to get the eggs and milk, cheese, and wheat-germ. That will make an interesting breading for the eggplant. Don’t forget the eggplant. I have stored them in the fridge but am not certain that is the best place for them. Hmmm, I’ll have to look that up. I like kitchen windows. I do not have one over the sink which is what I prefer, but two nice sized ones over the worktable that keeps the breadbox, the beautiful red embroideried catchall, and a large old-fashioned scale from my husband’s childhood kitchen. Here I stand peeling and slicing eggplant. I bought the eggplant at the farmer’s market because it was local and in season. Now I needed to use it so as not to waste it. This will be a meatless dinner but should be filling. Baked breaded eggplant with a tomato sauce topped with freshly snipped basil and feta cheese. It turns out nicely. After slicing the one small eggplant and one largish fingerling eggplant I will dredge them in the egg mixture and coat them with a mixture of ½ cup parmesan and ½ cup wheat-germ with some dried basil in there. This recipe is from the book Home for Dinner, 170 Family-Favorite Weeknight Recipes. It is a Better Homes and Garden collection from 1998. I picked this book up for $4.97 way back when from a Service Merchandise type store, now defunct. Bake the eggplant slices on a greased baking sheet for 15-20 minutes at 400 degrees until crispy. And they do turn crispy. Serve topped with tomato sauce. I made my own as I don’t use jarred sauce anymore. I put 1 cup canned diced tomatoes and ½ cup tomato sauce in a small pot, added Italian Seasonings, and simmered. Before that I sautéed one clove diced garlic in the pot. After breading the eggplant I had cheese/wheat-germ mixture leftover and I added that to the sauce. I forgot to put in the red pepper from the recipe but it turned out just fine. Add salt and pepper to taste. Before putting that in to bake and leaving the kitchen to its own devices. I went out to the backyard and sat with a book waiting for the husband to call saying he was on his way home. He calls me every time. It’s sweet. The call comes and I return to the kitchen. I put the baking sheet in the oven. I make a small salad for each of us and set the table. We will eat at the kitchen table tonight. 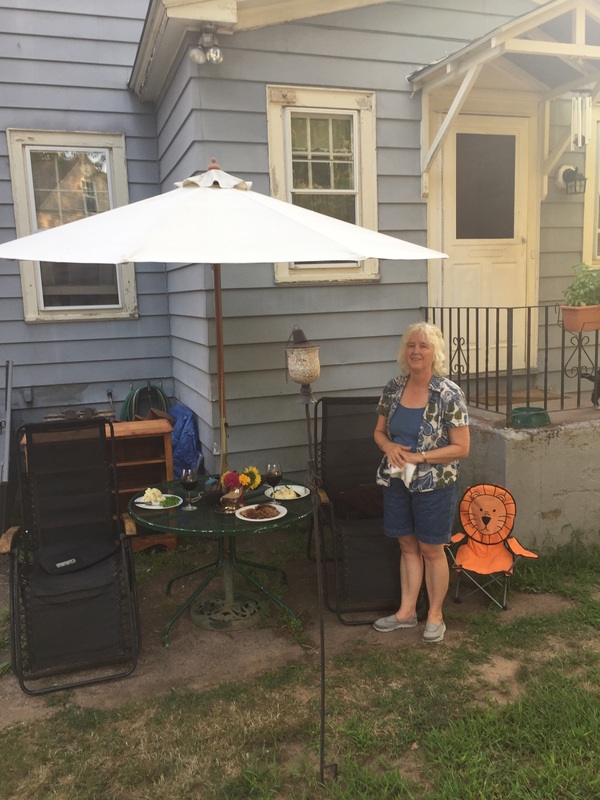 Often we eat in front of the television or sometimes outside in the nice weather. The table is cleared, dessert is eaten, and we again leave the kitchen to itself. That is most of the activity in the kitchen. I do not have a dessert to bake as there is still carrot cake in the fridge. We will not sit at the table to parallel play on our laptops this evening because we are too tired to think. Before bed the coffee pot is set again, my book is laid on the table to remember to take with tomorrow, and we take turns calling for Felix to come in for the night. He finally does. I’ve been thinking about fried okra. I think this is because most people don’t like okra and think of it as a slimy vegetable. It can be slimy. Other people think of it as just a thickener for gumbo. I remember fried okra in my childhood. It was not a common dish but very distinct. I remember my mother cooking it in that big heavy skillet of hers. So when the hospital’s greenhouse listed okra among its greenhouse farmer’s market offerings my eyes lit up! Yay! 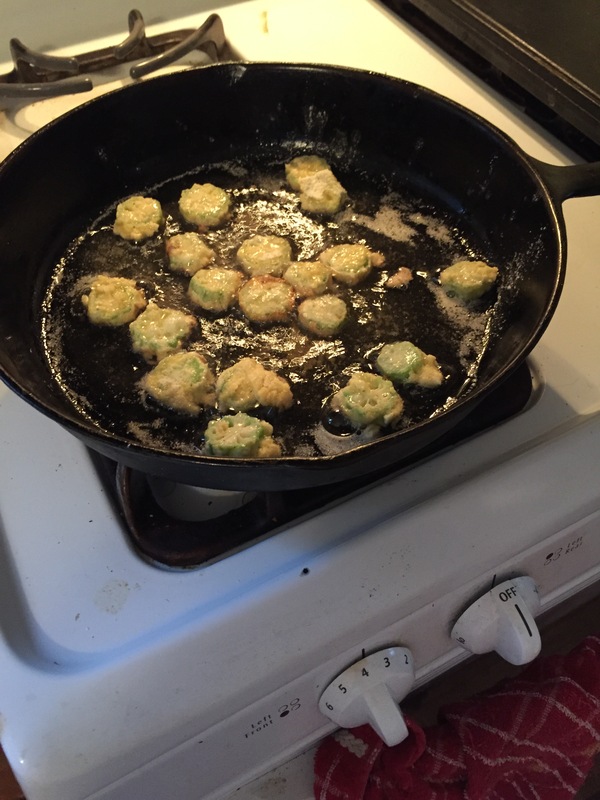 Here’s my chance to make fried okra. 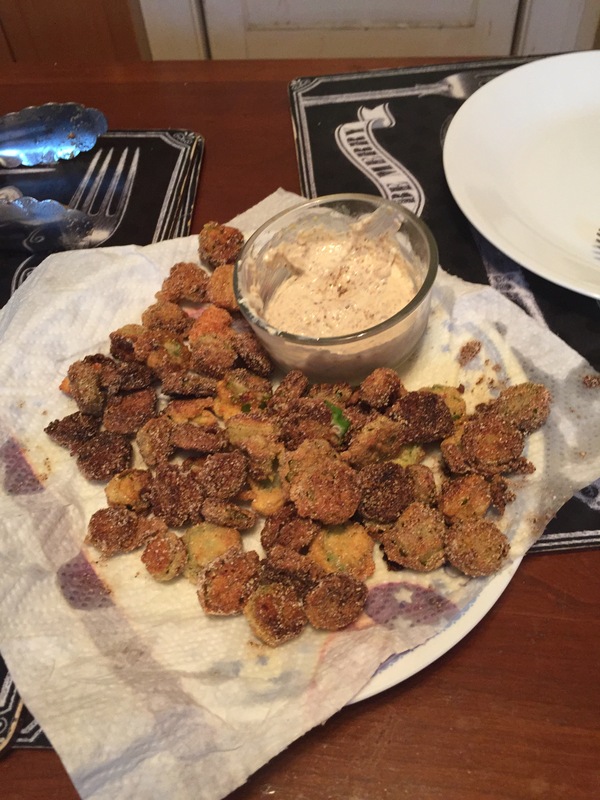 ‘Tis the season as I have been seeing fried okra recipes around the internet lately. 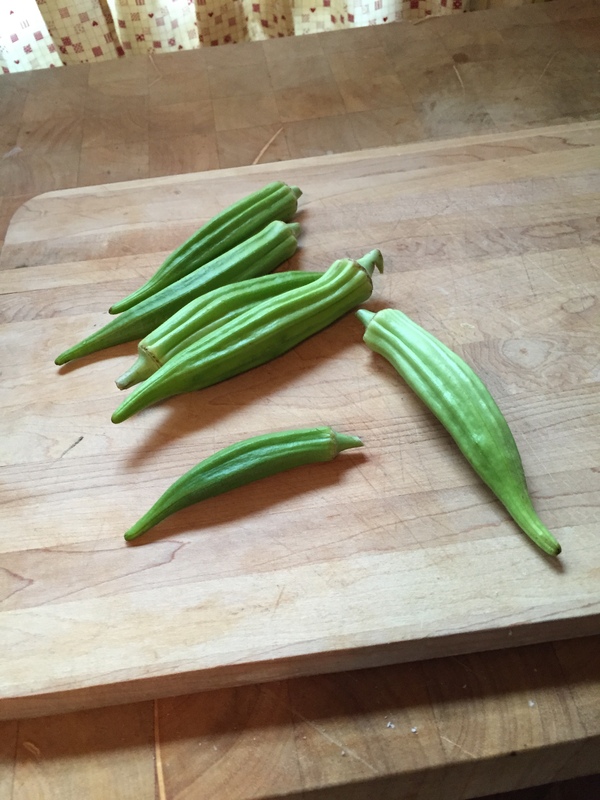 The opening day of the farmer’s market did not have the okra. As it turns out the okra came out after I had gone on to a meeting. So I asked the greenhouse coordinator to save me a batch next time. In the pouring rain I get myself over to the greenhouse getting drenched in the process. I find one customer in front of me with bags of okra. Oh no! And just as I spy out that situation, the greenhouse coordinator says “I need to save one of these bags…for Nancy” and he hands it directly to me. Did he not remember until he saw me? We’ll never know for sure. 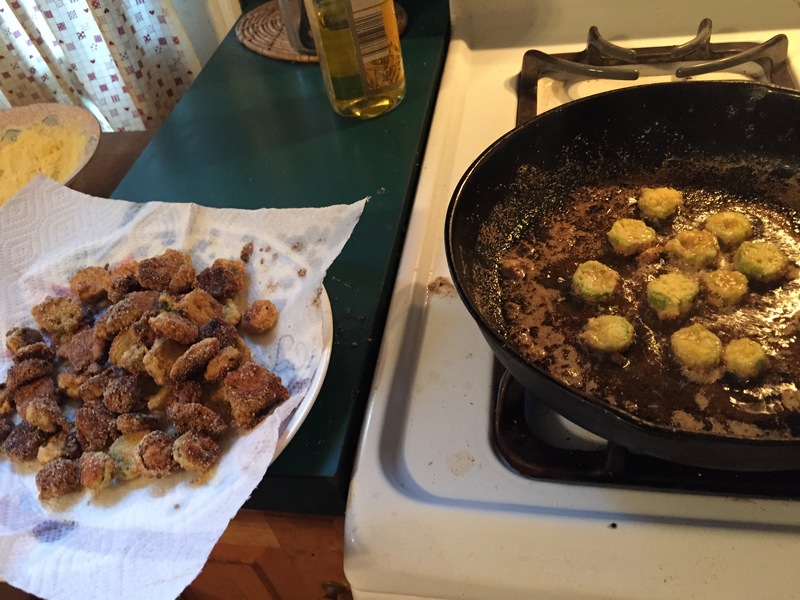 But what we do know is that I have a batch of fresh picked okra and I’ve put fried okra on the menu for dinner. What was to be for dinner that night was a question? I have too many ideas and meals that I want to make. I have fresh eggplant from the same farmer’s market. I had cooked up two of the fingerlings in a grilled ratatouille last week. Peeling them and slicing and then tossing them in the grill pan with a chopped onion, summer squash, baby bella mushrooms, and cherry tomatoes. I found a recipe for crispy eggplant with a tomato and feta sauce. The picture looks good and I have all the ingredients. But that would be a meatless meal and the hubby likes meat for dinner. What to do? The okra solves the problem. Grilled sausages for the main course and fried okra for the veggie. I will also serve the ever present cucumber salad pickling itself in the fridge. First I gather the ingredients and equipment. I have to run out to the camper trailer to borrow some additional cooking oil. I’ve got to make a grocery list. I have “shopped” my trailer for mouthwash, paper towels, aluminum foil, and dish sponge already this week! 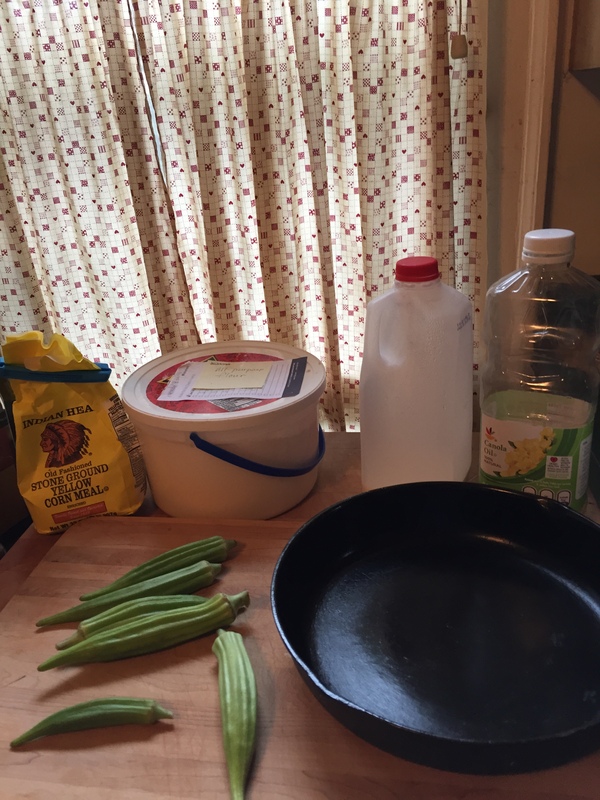 Gather all ingredients, slice okra, dip in egg beaten with milk, dredge in cornmeal (I added a handful of flour as well; not sure it’s really needed), fry in hot oil in batches . 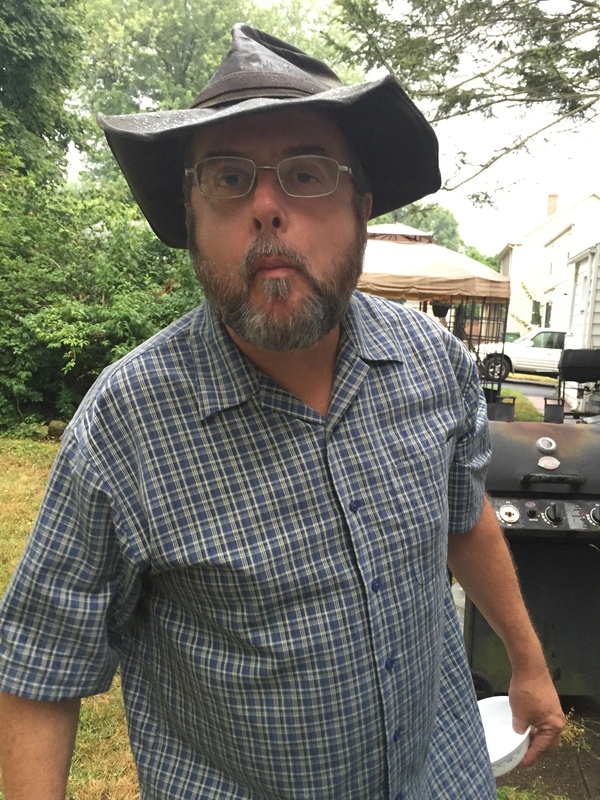 Here’s hubby tasting his first bite of fried okra. After which he made a dipping sauce of sour cream, mustard, and hot sauce. Not a bad idea. Truth be told: I’ve never made this dish before! But I went about it with the absolute confidence that it would turn out like I remembered. And it did! I make a good quiche. My family loves my quiche. The exception is my daughter who for some inexplicable reason became lactose intolerant since college. I don’t know how I started making quiches. My mother never made quiche. 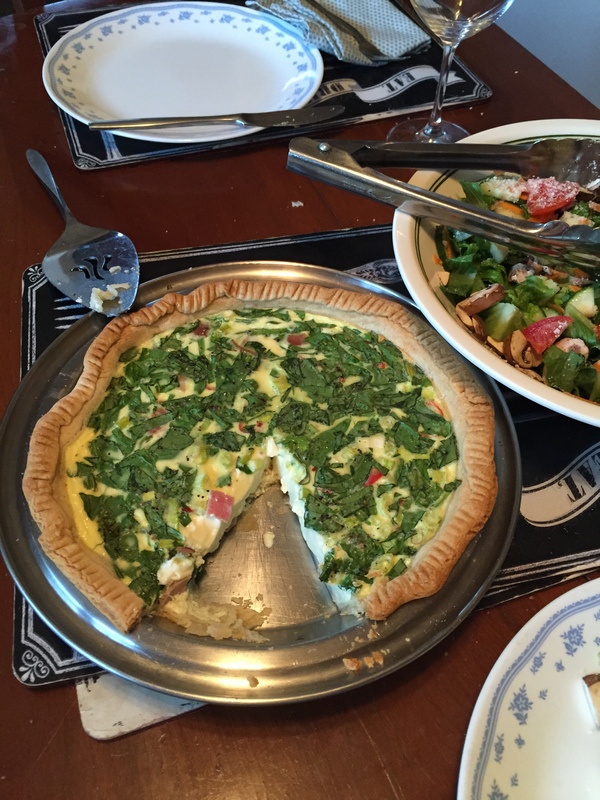 In the Midwest in the 70s when I grew up quiche was not a common dish. 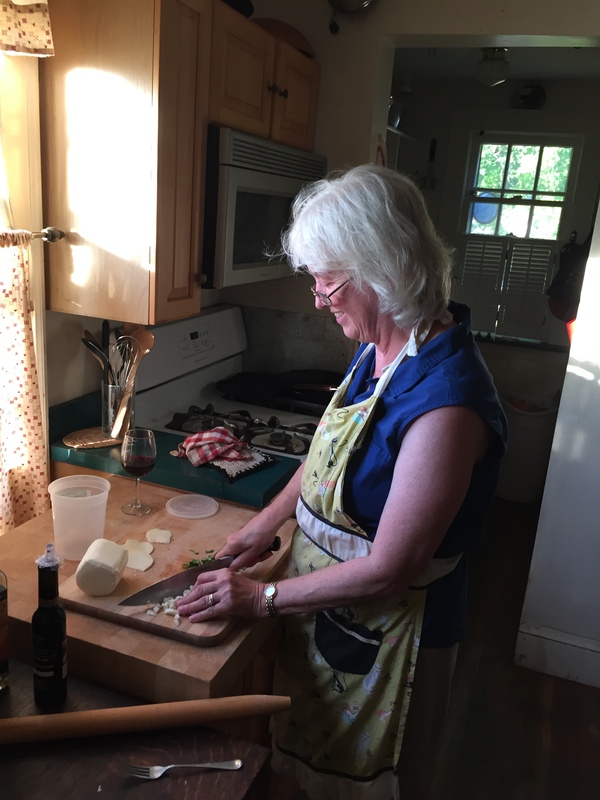 I think that only in the last ten years did I get interested in making quiche when I began to be a serious student of cookbooks and having had some quiche at some church potlucks here in New England. 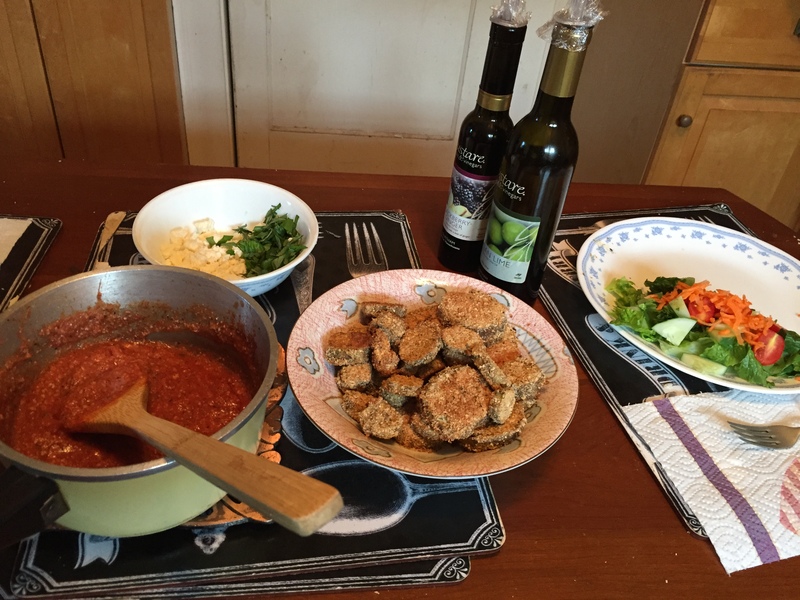 It has become an easy dinner and “go to” dish when it is difficult to decide what to cook. I have never been very good at pie crusts. I loved that one could buy the rolled up refrigerated crusts, first by Pillsbury and now store brands as well. Before that, there was a box of pie crust mix. This was as difficult as making crust from scratch. I also used the frozen crusts already rolled out into the aluminum pie tins. The bonus from those was the pie tin that could be used over again. My sister always made her own pastry crust. My mother had several recipes including a “no fail” crust that I had great success at failing at! 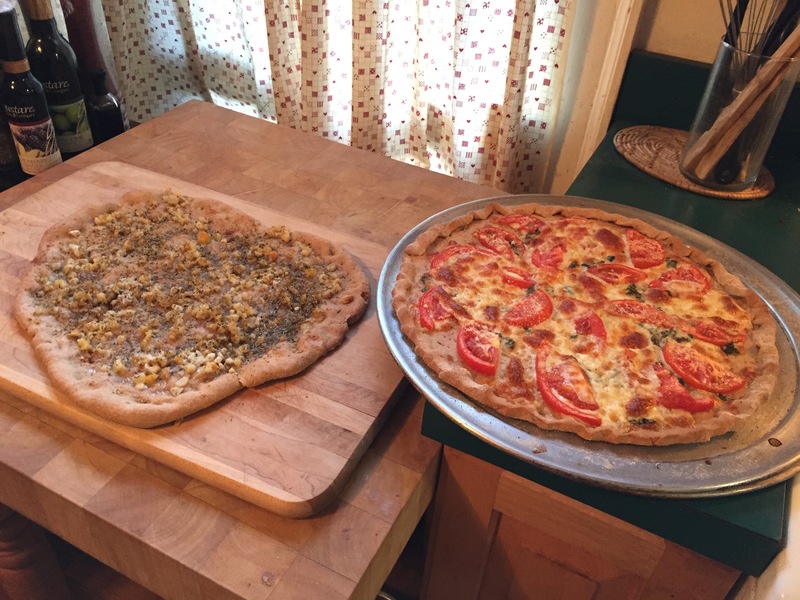 One year my son and I made two pies, one with store bought crust and one with homemade. The difference in quality was insignificant according to the family taste-testers. Then my son went off to the Peace Corps and a fellow Volunteer shared with him a pie crust recipe using apple cider vinegar and egg. That recipe is a keeper. I admit I still buy the refrigerated kind from time to time for “emergency meals”. But that recipe makes three crusts and when I make a batch I have pie crusts in the freezer if I haven’t made too many pies. I either line an aluminum pie pan so it is already set up or roll them out and put them in a nine-in round cake pan until frozen and then put them in a freezer bag. They lie (or lay?) nice and flat until needed. Why I use this recipe? I can make it in my food processor! In a one cup measuring cup: 2 1/2Tab. Apple cider vinegar; 1 egg and mix with fork. Add cold water until all liquid reaches a full cup. Slowly mix into flour/butter meal. Add small amounts of the liquid. You will have some leftover. 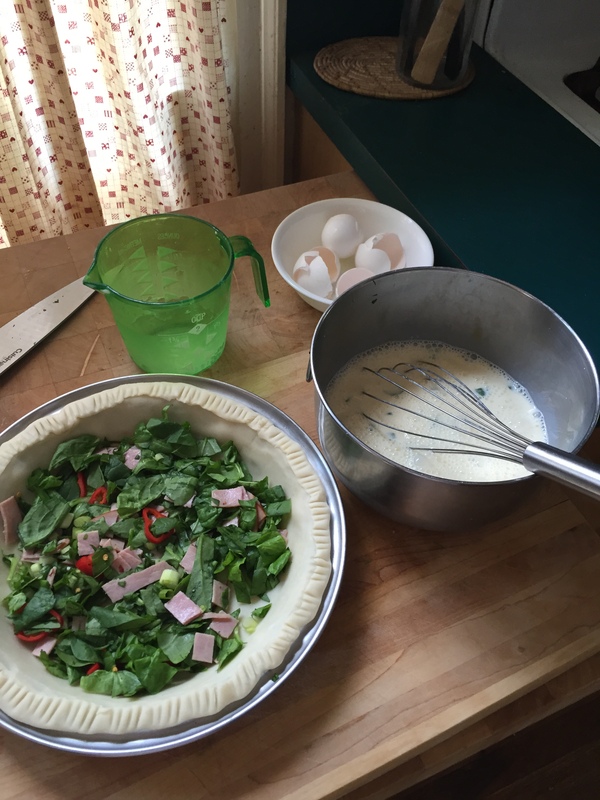 My quiche recipe: 4 eggs and 2 cups milk or cream or half and half or combination thereof. For other ingredients add whatever you want. One of my favorites is spinach and roasted red peppers. I usually use frozen spinach that I pan sear to dry. Drain the red peppers. Add a few grinds of fresh black pepper and a few shakes of dried red pepper flakes. Another favorite is bacon, onion, and cheese. There are so many combinations to try. I have made a Greek themed one with black olives, oregano, and feta cheese. I may have added spinach to that one as well. 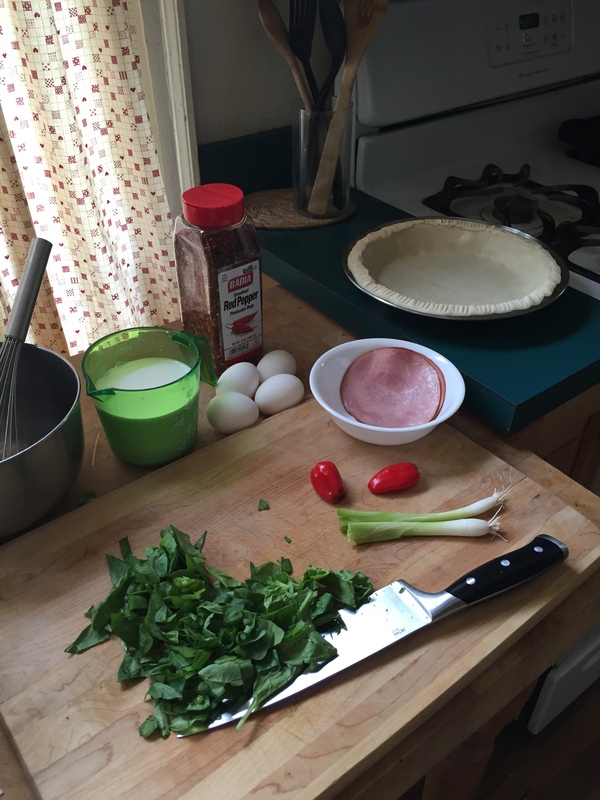 Quiche Lorraine is made with bacon and cream. Cheese was a later addition. The amount of added ingredients should not overflow the pie crust. Bake 425 for 15 minutes and then lower temp to 350 and bake for another 30 minutes. For this quiche I used fresh spinach that I chopped and two mini red peppers that I sliced. I added two slices of fresh ham that I diced as well. Served with a nice green salad and a glass of chilled white wine this made a wonderful summer dinner. There will be leftovers. Perhaps for breakfast? Since starting to write about food I feel this urge to take photos of all the food I prepare and keep lists of what food I eat throughout the day. But the purpose of this blog is to talk about thinking about food and recipes and how it plays a part of ordinary life. After all, one must eat, and if one has a family, must feed those folks too. I think about food a lot. I think about food in the morning: “What to fix for supper tonight?” “What can I take for lunch today?” “Do I need to go to the store?” “Which store?” I often look through my recipe books and find new things that look like they would be fun to make or sound really good tasting. I usually have two or three off the shelf and on the counter so I can peruse them when I come home from work. I do tend to pass up very fussy recipes that require too many steps or unfamiliar ingredients. I tweak some of the fussier ones to make them more ordinary kitchen friendly. I recently went through three of my cookbooks to mark out the recipes that I would be interested in making. I listed the name and page number on an index card. I would like to leave my children the recipes that I use the most as a memory. I could tape the index cards in the front cover for reference. The problem is I like different recipes from different books and I don’t want to copy and put everything in a notebook, or two or three or four! What to do? Well, to be honest I do compile recipe clippings and print-outs. I have three notebooks already and have just started on a fourth. I cooked basics for my two children when they were growing up. I did try to recollect those and put them in a notebook that I gave my daughter when she got married. I don’t think she knows where it is at this time. But it is in her house somewhere and if she is like me she will drift back to her upbringing as she gets older. The basics are spaghetti with meat crumbs, baked chicken leg quarters, best ever chocolate cake, eggs in a frame, lettuce salad and a snack cake I got off the back of a flour package. Oh let’s not forget the Fleishman’s bread cinnamon roll recipe for Christmas mornings. One weekend I was poring over the books wanting to bake a cake or muffins or some sweet. I chose in the end the snack cake but used white wheat flour. It bakes in an 8×8 pan and uses no eggs or butter. It is quite tasty and easy for a bite of chocolate when desired. There were too many choices from the books which drove me to an old staple (from one of my notebooks of recipe clippings). But not every meal must come out of a cookbook. For one of our weeknight dinners we were grilling a filet of salmon. It was one filet from a package of frozen. 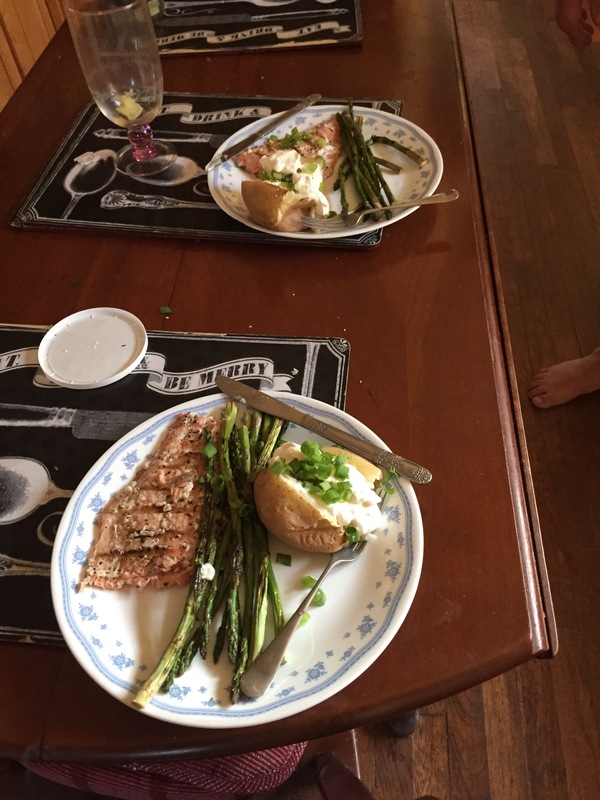 I had bought fresh asparagus and had found two recipes, one with pine nuts and one with lemon zest. But I just threw it in the grill pan and my husband grilled it along with the salmon. It was quite tasty with nothing added. The salmon had a bit of pepper on it and that was all. For the starch I “nuked” two smallish russet potatoes and we piled those with butter, sour cream, and freshly chopped chives. A yummy meal all in 20 minutes. And for dessert I whipped a bit of heavy cream and put it on top of bowls of fresh raspberries. A perfect example of whole food simply prepared that is satisfying and enjoyable, both to prepare and to consume. Fish was known as brain food. Food for thought. On my quest to eat more whole/real foods I have been reading ingredient lists and looking for whole grains. So I bought white wheat flour to replace my all-purpose flour. Whole grains are better for you even though I usually buy unbleached flour. I don’t know if the whole/real food folks were bakers before they went healthy but there is something to be said for all-purpose. Pizza night. My husband and I decided we would make pizza. 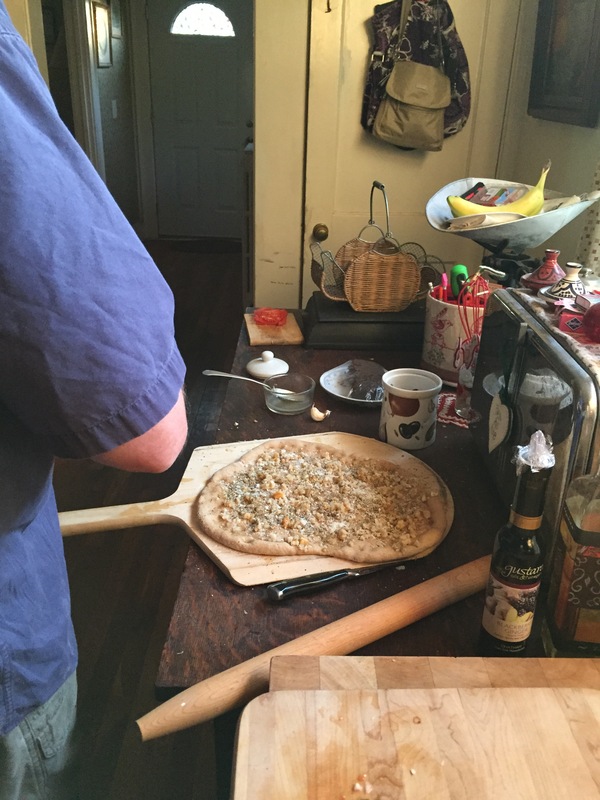 He wanted to make a clam pizza that he remembers from a pizzeria in New Haven. I have a thriving basil plant so I think Margherita. I make the dough using white wheat flour. Half goes into my husband’s hands and half into mine. We hand stretch the dough. I want mine thinner so I get out the rolling pin and make a good circle and then pre-bake that for about ten minutes in a very hot oven (450), pricking it all over with a fork first. Hubby follows suit but his is more artisan in shape. Meanwhile we prepare our toppings. 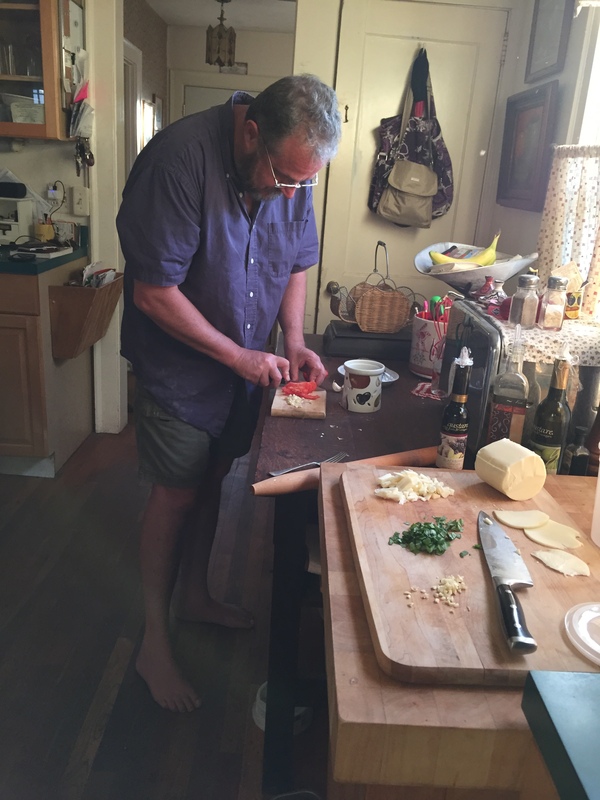 He uses canned clams, butter, garlic, oregano, and Romano cheese. I use garlic, fresh basil, tomato slices, and mozzarella cheese, diced and sliced. Mine’s pretty; his is artistic. We bake them and are very excited about our pizzas. The first bite tells my husband that the crust is not at all what he wanted it to be. Whole wheat crust is thick and not flaky. One would have to adjust to the taste. It is rather like a thick cracker. 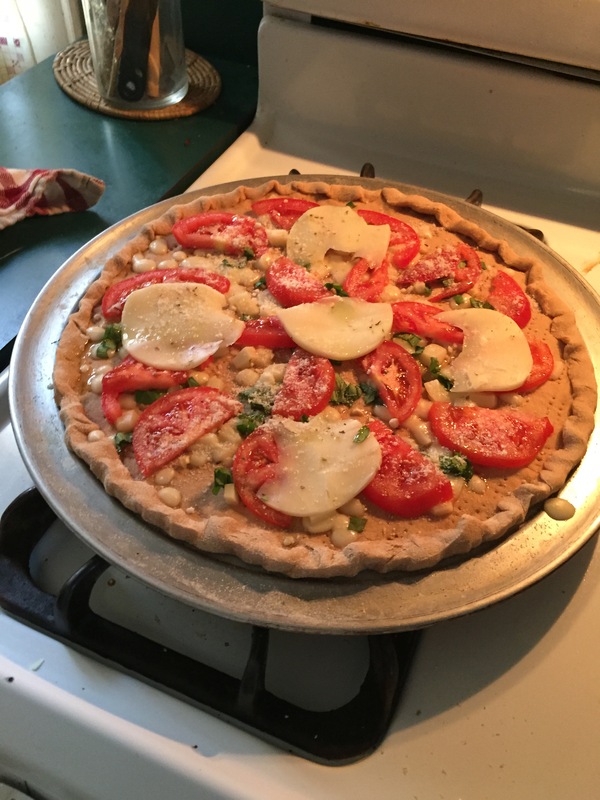 My husband announces that he will make his own crust next time. I’m thinking whole wheat pastry flour might be the answer. We will eat the leftovers cut up in small bites like appetizers. It wasn’t that the pies didn’t turn out. It was just that they were not enjoyable. Moral of the story: I am a baker and I will on occasion use more processed flours in order to enjoy the goods I make. I bake sweets much less than before so when I do decide to make a cake or whatever, it should be decadent!